According to the Turkish authorities the man was linked to the so-called Islamic State (IS, or ISIS), making this the terrorist group’s fourth deadly suicide bombing in Turkey in one year. Previous attacks that have been ascribed to – but haven’t been claimed by – IS occurred in Diyarbakir in June, Suruç in July and Ankara in October, with a death toll totaling around 140. The Kurdish groups and organizations targeted by IS were at the same time actively opposing the ruling Justice and Development Party (AKP). This sparked rumors of the terror group being in cahoots with the Turkish government. Accusations ranged from the two parties actively cooperating with each other to the government’s willful neglect of the safety of its Kurdish citizens. That the Turkish government considers the Kurds at home and abroad as a bigger threat to the national security than IS has never been a secret. Moreover, the fact that IS is fighting against two of Turkey’s key enemies in Syria – the Assad regime and local Kurdish forces – makes that Turkey has always been hesitant about seriously and directly confronting the jihadists. It is in this context that the attack in Istanbul seems out of place. Why would the Islamic State group risk antagonizing one of the few parties in the region with which it has at least a some shared goals? What is there to be gained from dealing a blow to Turkey’s already hampering tourist industry and force the country’s hand in taking a firm stance against the terrorist group? The first matter is the timing of the attack. If the aim is to hit Turkey by targeting its $30 billion tourist industry, the bomber couldn’t possibly have chosen a worse time than a cold Tuesday morning in mid-January. The site of the attack is the exact location where during the holiday season thousands of tourists line up everyday to visit the Blue Mosque. The number of victims would undoubtedly have been many times higher if the attack would have taken place a few months later. This would have had a truly devastating effect on Turkey’s tourist industry. The curious thing is, why would a member of the so-called Islamic State, who has come to Turkey with the intention of committing a suicide bomb attack, make himself known to the authorities – especially after two of his accomplices have just been arrested? Why have your picture and fingerprints taken and give away the address where you’re staying – which he did, according to the official reports – instead of laying low for a few days before executing the plan for the attack? Finally, there is the curious issue of IS never actually having claimed responsibility for the attack. Nor for any of the other attacks mentioned above, which all have been attributed to the terrorist group by the Turkish government. The past year has seen a string of terror attacks committed by the Islamic State group outside of the territories that are under its control – from Jakarta to Paris, Tunis to Beirut – and each and everyone of them has been claimed by the terror group, often within hours. Oddly enough, not a single attack in Turkey has actually been claimed by the terror group. Raising these questions and irregularities is not for the purpose of pointing fingers at one party or another. They simply serve as a mental exercise to remind one that, especially when entering the realm of terror and counterterrorism, the reality is rarely how it is presented to the public. 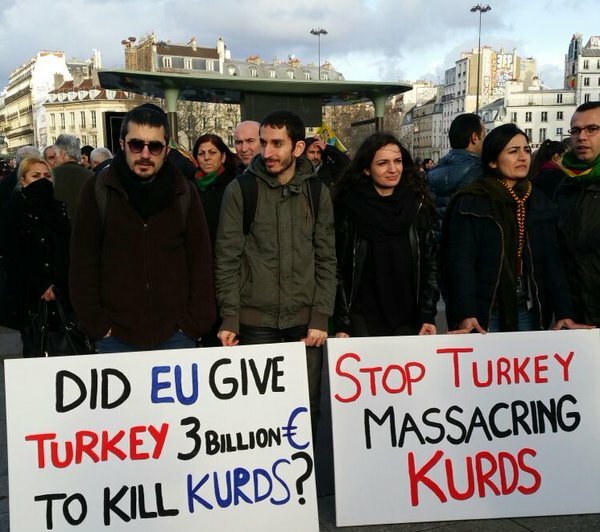 These baseless allegations serve no other purpose but to frame the party of the Syrian Kurds, the Democratic Unions Party, or PYD, as the terrorist organization Turkish authorities claim it to be. Immediately after the Ankara bombings in October, similar attempts at spreading false propaganda were made. Prime minister Davutoğlu coined the term “cocktail terrorism” and claimed on national television that the attack was the work of a coalition between the PYD, the Islamic State group, Syrian secret services and the PKK. The attack has also provided Turkey with the necessary pretext to launch attacks further into Syria; at the town of Manbij – the bomber’s hometown – to be precise. This is a highly strategic target because it’s location in the heart of the proposed “security zone” Turkey has wanted to establish for a long time. Coincidentally, Manbij is also the next stop for a coalition of Kurdish forces and their allies who have been gaining significant ground at the cost of the Islamic State group after a recent string of important victories. Also, the odd attempts by the Turkish prime minister to blame the attack on the PYD clearly serve to support Turkish efforts at keeping the Syrian Kurds out of the Geneva peace talks. Judging from the news, the Istanbul attack has certainly led to renewed efforts by the Turkish government to confront and attack IS. Targets in Syria have been hit, and dozens of alleged IS members have been arrested in the country. However, it’s still a question why these actions weren’t taken before the Istanbul attack, and to what extent they will have a serious impact on IS’ ability move around and organize in Turkey with near-impunity. Answers to the questions raised in this article might never be known. But the fact that part of the blame for the attack is tried to be put on the Syrian Kurds shows that, besides a deeply tragic event, it is also a good opportunity to frame the public perception and pursue a malicious political agenda. Joris Leverink is an Istanbul-based political analyst, freelance writer and activist. He is an editor for ROAR Magazine, columnist for teleSUR English and Turkey-contributor for the IPS news agency. He blogs at Deciphering Disorder.